Do you want to join a company where the future is programmed? You’re in the right place with adesso! You’ll be part of the team right from day one. Together, we implement challenging projects for our customers. To do this, we need people who are willing to contribute their knowledge, their talents, and their skills. 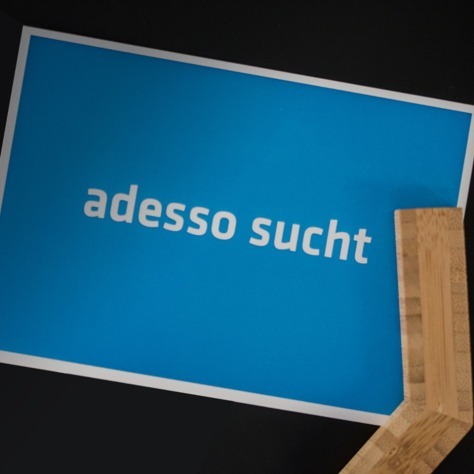 If you want a first-class employer: Welcome to adesso! The family atmosphere is characterised by a special feeling of “us” - we’ve even got our own word for the members of our family: adessi! At our Welcome Days, we give you a warm welcome and familiarise you with all you need to know. All new adessi take part in a Welcome Day for new starters from all sites: to welcome you to the company and provide opportunities for networking and getting to know one another. We provide you with everything you need for a positive start to your new job. Your “guide”: A mentor will help make your induction phase run smoothly. They are available to help you with any questions at the start and will be your first contact person in the company. Your mentor will help you along your first steps. We want you to feel at home when you start at adesso. With the support of your mentor, you will enjoy a successful start with your team and your tasks. We value conversations and direct dialog with you. We’re interested in how you’re getting along. So we listen, because your opinion is important. This includes asking you to complete a feedback questionnaire after your first few weeks. We believe that everyone benefits from honest communication. See our jobs database for open positions. We are curious to get to know you!